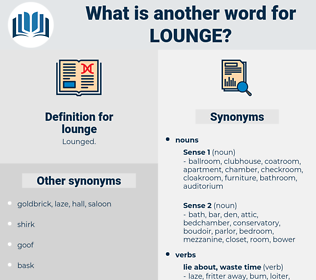 What is another word for lounge? 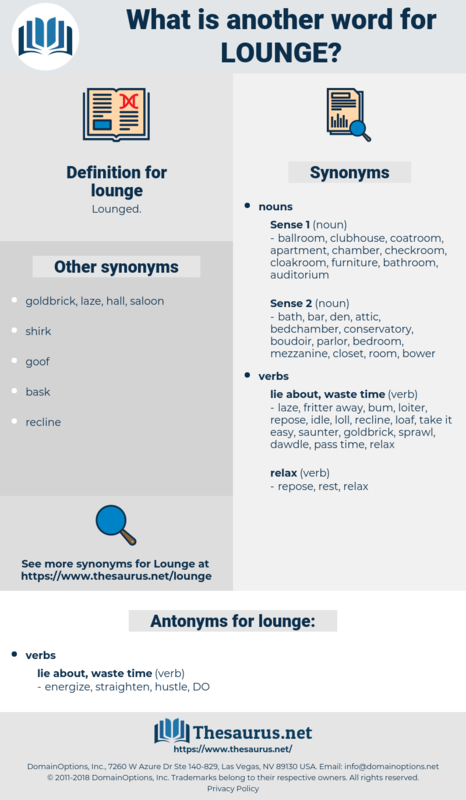 parlor, parlour, salon, foyer, saloon, barbershop, terminal. Too poor to possess a chamber, he slept on a lounge in the public room. We will go to his cabin now, explain what has happened, and then lounge around the stable quarters of the Rangers, where you shall have a glimpse of your beloved Silver Heels. laying, lining, line coach, link, lineage, lemniscus, lameness, languish, luminesce, luoyang, lunacy, linaceae, longish, lionize, launch, Lamna Nasus, loaning, longyi, low mass, lanugo, lanky, lammas, linnaeus, lilongwe, lemmus, lingua, lyonnaise, leuwenhoek, lenience, Ling Ko, lanius, linac, lanseh, lulling, lummox, luminous, linguica, leeuwenhoek, lemnaceae, lemnos, loins, lense, leymus, lunch, Lamiaceae, lime juice, lemon juice, long, lange, limning, lioness, liomys, longwise, limax, long ago, lowness, linz, low-lying, lingo, lungi, longways, Lynx, leniency, lamaze, linux, Lyonnaise Sauce, lemming, luminance, lanchow, lionise, lallans, linage, long-ago, lonas, lunge, lyonnais, launce, loyang, lank, lion monkey, limnos, lanzhou, lance, lemon cheese, lynch, lung, links, Lillian Gish, ling, linkage, Lowliness, lansa, lungyi, limosa, leanness, lying, language, lens, leaning, lyons, lennoaceae, lanchou.